Whether it’s restoring power to your home during a power outage or keeping things comfortable in your RV, a portable generator can really help you get the job done. However, the constant noise can be really uncomfortable. Going for a quiet generator will save you and your neighbors from the constant noise. A quiet portable generator with an engine that runs quieter and with less vibration, within the available budget. It’s hard to believe, but some of the quietest generators are quieter than an average conversation. Not to mention, a large aftermarket exists in advanced noise reduction solutions achieving better quiet running generators. Fuel Type: Gas Capacity: 3.4 gal. Tank Run-Time @ 25% Load: 20 hrs. Noise Level @ 25% Load: 49 dB. Fuel Type: Gas Capacity: 1.0 gal. Tank Run-Time @ 25% Load: 9 hrs. Noise Level @ 25% Load: 51 dB. Tank Run-Time @ 25% Load: 9.5 hrs. Noise Level @ 25% Load: 53 dB. Tank Run-Time @ 25% Load: 10 hrs. Fuel Type: Gas Capacity: 1.06 gal. Tank Run-Time @ 25% Load: 7.7 hrs. We are focusing on small quiet generators, mainly the 2000W and 3000W range inverter generators. They carry enough power to keep your critical appliances running during blackouts or to power your camping site in your next adventure. In addition, they carry the best features to run quietly. The Honda EU3000iS, silent, dependable, and provides reliable high-performance. An ideal portable power for RVs, camping, and basic home backup. This quiet generator employs inverter technology to produce up to 3000 starting watts, and 2800 watts of continuous clean and stable power, that can be used on sensitive appliances and electronics. Not only can it run your laptop, mobile device, fridge, and microwave that you may take with you to camp, it can also power the average 13,500 BTU AC unit that you may have in your RV. This gas powered inverter generator runs for 20 hours on just 3.4 gallons. If you require much more power, then you can connect two of such generators with a parallel cable for double the power. Has 2 handles on the sides and moving it from place to place is a two-man job. 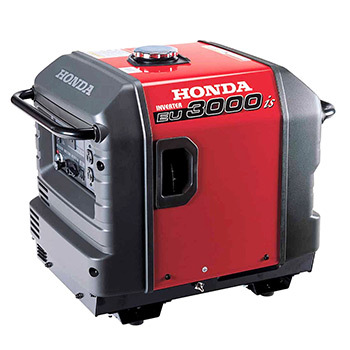 The Honda EU3000iS is a reliable, powerful generator that runs smoothly and quietly. And proves more than capable of handling your power needs. This generator produces between 49 to 58 decibels of sound depending on the load, making it the quietest generator for home and outdoor life. It has as an eco-throttle system that ensures efficient fuel consumption in line with the specific load requirement. Weighs slightly over 130 pounds, and the fact that it doesn’t have wheels makes moving it around quite a challenge. However, it has a wheel kit that you can purchase separately. A powerful machine but comes at an expensive cost. The Yamaha EF2000iSv2, a compact fuel-efficient gas powered inverter generator. Rated at 2000 watts maximum output, and 1600 watts running output, it can run a wide range of appliances. The gas tank only holds a bit over one gallon and runs over 10 hours at 25% load. A quiet RV generator operating volume is a very important aspect, whether you’re camping, tailgating, or RVing; noise and portability are important, and this machine will not turn you down. It’s easy to start, with overload circuit breakers, low-oil warning system, and a fuel gauge to track the fuel level. It’s also expandable, allowing you to double your power by connecting it to another unit. The fact that it’s an inverter generator allows it to produce sine wave energy, which is safe to use with sensitive electronic devices. It’s also CARB compliant, has low emissions, and can be used anywhere. Weighing under 44 pounds, the Yamaha EF2000iSv2 is lightweight and user-friendly. Has a smart throttle feature that varies the engine speed based on the required load; improving fuel efficiency, and reducing the noise output. Exceptionally quiet, at quarter load produces 51.5 decibels, and at full load produces only 61 decibels. A reliable machine but a bit on the expensive side. WEN 56200i does it’s best to be the most eco-friendly. Its engine creates 2000 watts of startup power, leveling out at 1600 watts of running power. Quiet for its class, 51 decibels at 25% load, making it one of the quietest gas powered inverter generators to take to a campsite. It allows you all the power of a big, noisy machine, but none of the size or noisiness. In eco mode, this generator is able to automatically adjust its fuel consumption, using only the fuel it needs. With one gallon of gas, it runs for 6 hours at 50% load. This inverter generator is designed to limit its total harmonic distortion to under 0.3% when no load is present, and under 1.2% at full load. Creating clean energy that is free of spikes and drops in voltage, making it safe to use with sensitive electronics such as mobile devices and computers. It’s also powerful enough for big jobs, like heaters, and microwaves. WEN 56200i combines user efficiency, clean energy, while also being light-weight. A cost-effective and fuel-efficient quiet portable generator. Weighing 48 pounds, and supporting a convenient carrying handle. Easy to transport, while maximizing gas efficiency. Does not come with a grounding wire. You would need to purchase the grounding wire separately. Poorly designed oil compartment, you may find it a challenge to pour in oil without splashing out. The Champion Power Equipment 73536i gas powered inverter generator is a lightweight, long-lasting addition to any RV, campsite or cabin. With a 25% load, this little power-box can last up to 9.5 hours on a full gas tank. At 53 decibels of noise, 23 feet away, and it sounds like an average conversation, making it a relatively quiet generator to run. Packed with some fun, user-friendly features, such as low oil shut-off sensor, easy pull recoil start, and an economy mode to conserve gas. This generator is as versatile as it is compact. With 2000 starting watts and 1700 running watts the Champion Power Equipment 73536i is designed to seamlessly integrate with another. Giving you enough power to continuously run a 15000 BTU air conditioner. The power that this generator produces is very stable sine wave power; making it suitable not only for that big AC in the summer but also for smartphones and laptops. This generator is a great option for long summers in the great outdoors. Just under 50 pounds, a built-in carrying handle, and a special stack-able design make this a highly convenient traveling power source. Fuel efficient with an economy mode switch. Lacks a gas drain and an oil drain plug. Surge capacity is low, as a result, this generator is not recommended for emergency home backup power. 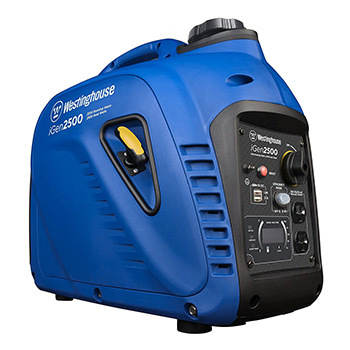 The all-new Westinghouse iGen2500 inverter generator, a great addition to our list. Has 2500 starting watts and 2200 running watts, and with a single gas tank, it runs over 6 hours at half load. Weighing 48 pounds, comes in a new design with a built-in carry handle. This inverter generator creates clean power that doesn’t suffer from the electrical spikes and drops that are common with regular generators. Making it safe to use with your sensitive electronics, such as tablets and computers. The iGen2500 boast impressive design features, including a LED display, a hood that is double insulated, dual quiet mufflers, and asymmetrical fans. These features are effective at keeping the machine cool, increasing its durability, giving it impressive power. In addition, limiting the noise level during operation. Customer service is also one of the best features of this machine, with nationwide customer service and support. Overall, the Westinghouse iGen2500 is powerful and full of great features, while also being backed by a reliable company; making it great for a variety of uses. Its ability to adjust engine speed based on load is very convenient. Making it more fuel-efficient, saving you money and giving you longer run time. Easy to use control panel with LED display, showing fuel level, power output, voltage, and remaining run time. Operates quietly, rated at 53 decibels when at quarter load. Lacks wheels for easier transportation. The Generac 6866 iQ2000 is a lightweight, feature packed, inverter generator. The generator itself only weighs a little over 46 pounds and has an 8 hour life on a full tank at quarter load. With 2000 starting watts and a running output of 1600 watts, it’s more than capable of handling your basic power needs. It has a very good feature of controlling engine speed depending on required electricity needs resulting in a quieter operation. And can easily be connected to another generator of the same type to nearly double your power output. This generator is chock-full of electric features; allowing you to tell your wattage output at any time, view your current fuel level, and adjust your power output based on the load requirements. While the features this machine has can be unstable, they’re a great step towards more functional generators, and can be repaired in the event they do act up. Fuel efficient with its economy, standard, and turbo modes. While full of unique and exciting features, but they’ve been known to be a bit unstable. These features regularly stop working or need repair, making it frustrating if you purchase this machine only for its innovative features. Idles roughly, making it not very quiet when under heavy load. Engine Displacement (cc): 196 cc. 79 cc. 79.7 cc. 80 cc. 98 cc. 80 cc. A generator’s quietness depends on many factors. For example, the size of the engine, the quality of the muffler, and whether the engine has an enclosure. These are all major factors that would directly impact the loudness or the quietness of a generator. Not to mention, the quality of the engine. In fact, cheap air cooled generators are usually not quiet. Quiet portable generators tend to have water cooled engines. Understanding the factors that would affect the loudness of a generator and understanding different sound levels is very important. The loudness of a generator is expressed in decibels, dB, or dBA. The higher the dBA for a generator, the louder it is. For comparison, calm breathing is 10 decibels, whisper conversation is 30 decibels; a normal conversation is 60 decibels; while a vacuum cleaner or a busy traffic street can be at 80 decibels. Over 140 decibels causes pain in the eardrums and might cause hearing damage. The difference between 0 dB and 140 dB is far more than just numbers. There are no universal standards for the amount of permissible noise for generators. Rather, each model is different. Some manufacturers are famous for their super quiet generator engines with very low decibel levels; such as the Honda EU2200i, which is rated at 57 decibels when running at full load. During manufacturing, sound measurements are taken at one meter from the unit for the sake of convenience. However, the standard distance stated by the industry is 23 feet (7 meters), unless otherwise stated. In general, the sound level of generators ranges from around 50 dB to 110 dB. There are no universal standards for the amount of acceptable sound levels of a generator. Rather, each application and environment in which you are using the generator is different. Sometimes you may find yourself compromising the power output in order to get the quietest generator available. However, considering the applications that you will be powering, will allow you to get a quiet generator within the suitable power range. In general, the quietest generators should have ratings under 60 decibels. And if the only difference between two generators is just a couple of decibels, don’t think of these 2 decibels lightly, cause in reality, it will make a big difference in the sound level. In fact, for every 10-decibel increase of your generator sound level, the noise gets 10 times louder. A generator rated at 70 dB is ten times louder than a generator rated at 60 dB. Sounds from a generator happen due to some factors, such as the size of the engine, the exhaust, the vibration of the unit. Understanding the reasons behind generating electricity quietly, will allow you to make the right choice towards choosing the quietest generator that best fits your needs. Our quiet generator reviews include some of the best ones. Generator’s noise varies depending on the size of the engine and its load and can be as high as 110 decibels. One of the main factors affecting a generator’s sound is the engine’s size. Sometimes this is going to vary depending on the model of the generator. If a couple of generators have the same power output but vary in the noise level, then this could come down to a better engine. However, more power output will always result in a louder generator. For example, a 3000-watt generator will be louder than a 2000-watt generator. And, the decibel level will also always change according to the load required from the generator. Apart from the size of a generator, the noise produced by the engine depends on many factors. For instance, the air density around a generator. Ambient surroundings can affect the sound rating produced by two identical gen-sets. In addition, the exhaust which is a major contributor to the overall noise level of a generator. Not to mention, the cooling fans which apart from cooling the system, they are also responsible for altering the quietness of a generator during operation. The sound of a cooling fan varies depending on the operating speed and the fan blades design. However, a conventional generator (open-frame) noise level is altered due to some other extra factors. Such as the alternator, which has another internal fan that adds to the total noise level. Also, current instability of the alternators produce some mechanical noises with changes in load. In addition, the structure of these regular generators gives more space for mechanical vibrations. Due to the friction of various parts and components of the generator, it creates an extra mechanical noise. Inverter generators tend to be significantly quieter than regular generators. Due to their compact design, they use a smaller engine, which accordingly reduces the noise levels. The efficiency of an inverter gen-set in producing its electrical current is the main reason for having a smaller engine. In addition, the body casing of the gen-set also reduces the sound. Inverter generators are constructed out of insulated, sound dampening materials that absorb noise vibration produced by the generator. Not to mention, an inverter generator is a solid 10 to 20 decibels quieter than the average portable generator. Other silenced portable generators are available with an acoustic enclosed housing which dampens the sound produced. In this case, the noise level is less than an open frame generator. However, inverter generators stand out as the quietest generators on the market today. The smart throttle is one of the best noise reduction features in portable generators. Regular generators run at a constant RPM speed regardless of the load. This makes them not only louder but also less fuel efficient. The engine’s ability to run at different output levels will remarkably reduce the noise level. With this feature, the generator automatically varies the engine speed to optimally run the required load. It makes sense that the generator is loudest when it’s running at full load. So, when the output level is decreased, you get a quieter running generator. Generators are essential, but a loud generator is hard to ignore, and the constant noise can be really irritating. There are six simple strategies for reducing the noise of your generator. Each of the following steps will reduce the noise level in a different way. However, none of the following steps should interfere with the flow of cooling air to the generator in any way. This may seem like an obvious solution, but the simplest way to reduce the noise of a generator is to maximize the distance between your house and the noise source. Simply increasing the distance of the generator from your activity area may be enough to solve the noise issue. By investing in long extension cords, and positioning the generator further away; the sound waves would spread over a bigger area and therefore give less acoustic intensity. In outdoor open spaces, the general rule is that when you double the distance, you get a 6-decibel noise reduction. While doing this, avoid putting a loud generator too close to any nearby neighbors. Also, ensure that you keep the generator safe in a dry and stable place to avoid any damage. Whether you set your generator near your activity area or far from it, the way you position it will always affect how noisy it will be. If your generator isn’t level, it will be causing a lot more noise and vibration sounds. Always make sure the generator is on a flat, level surface. Using the leveling feet, stabilize your portable generator to the desired position. While doing this, ensure to point the generator’s exhaust away from your home or your campsite. The exhaust is the loudest part of a generator so positioning it to point away will have a significant difference in the noise level. The exhaust is probably the loudest part of your generator. A standard generator silencer should have a great effect on the noise level. Not to mention, long exhaust piping alone provides an additional level of noise reduction. So it may be worth it to upgrade to a better one. You can either replace it with a huge generator muffler or if you are a pro in handling mechanical stuff then try replacing it with your car or motorcycle muffler which will help you to quiet the noise significantly. You can find these easily at a local motorcycle custom shop and you may enjoy great results by changing the basic generator mufflers with motorcycle mufflers. And, you will also need to create a custom pipe system to attach it to the exhaust of your generator. The exhaust pipes of generators are generally pointed horizontally which makes the sound waves move in one direction. In addition, the pipe may be pointed directly towards your home which can be really irritating. 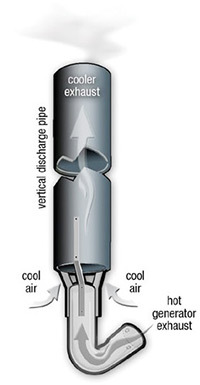 By changing the direction of the exhaust pipe vertically the sound waves will be directed towards up rather than out. It will give some improvement to your generator noise level. This is one of the most effective ways of reducing the noise of a generator. Placing the generator in an enclosure will help in absorbing and also deflecting the noise. However, you don’t simply put it in an enclosed box. Make sure the gen-set gets air to burn, gets airflow to keep cool, and it can freely get rid of its exhaust. The exhaust needs to be vented, and airflow is needed to prevent the unit from overheating. As a result, the enclosure housing must be properly ventilated and spacious for your generator model. Checking different designs may be necessary before finding the right one for a whisper quiet generator. 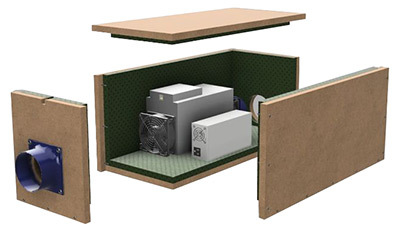 Generator enclosures can reduce the noise level by up to 10 decibels. If an enclosure alone doesn’t do the trick, insulate the enclosure to create an additional barrier. There are lots of different options to use such as sound absorbing foam, rubber waffle pads, and dampers. Insulating the area around the generator with sound-absorbing materials or installing acoustic barriers can considerably reduce the noise. In addition, putting rubber waffle pads on the ground and placing the generator on top of them isolates the vibrations and damp the noise as well. If all the above steps didn’t reduce the noise level to a minimal level, then consider upgrading to the most quiet generator while comparing different models. 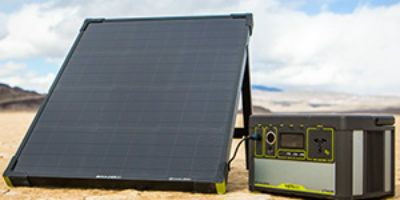 Also, make sure to check the fume free, silent generator list of the solar portable power. For optimal use of your generator, you can check our list of the most useful accessories for portable generators. Today, manufacturers are taking big steps towards the science of noise reduction of generators. Controlled by the desire of the consumers to have a more quiet environment. With the growing demand, we tested and compared many models in an attempt to find the quietest portable generator on the market. With our best quiet generator list, finding a super quiet generator that best fits your needs should be an easy job. In addition to the aftermarket strategies towards having a quiet portable generator. Wonderfully informative source of specifications, ratings, reviews and unbiased pros and cons of quiet-generators which has helped me to make an educated decision in purchasing the best choice for my needs, thanks Scott H, N.C.